You must be a member of the New York Soccer Group to attend this activity. Would you like to join this group? While Ronaldo's blazing his own trails in Seria A, leaving the Catalans and Madrilenos to fight it out amongst themselves ! Can Vidal and Boateng help the Barca vets to deliver a clasico victory ? Or will Real's usual suspects rip them apart ? 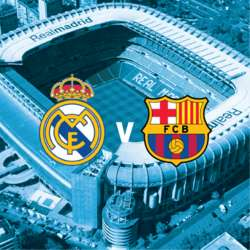 Don't forget Barca plays Madrid TWICE in the Copa Del Rey before the clasico... there's a lot on the line ! You don't have to be a soccer expert to come out and enjoy watching the game. This venue has hosted us for all our soccer games for the last few years. The downstairs lounge has a projector screen and bar TVs, foosball, shuffleboard, arcade games, photobooth with lounge and bar seating. There's plenty to take advantage of here, including the refreshing cocktails and savory bar bites. *PLEASE ONLY RSVP IF YOU ARE REALLY COMING - This goes a long to way to help the organizers and bartenders and kitchen plan resources for the day.